Don't let your buddy be the only person in town with a train horn under his hood. 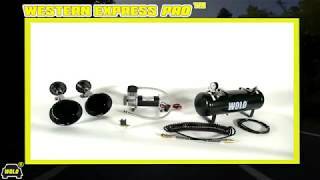 Get the Western Express Pro train horn today from RealTruck, and start turning some heads. 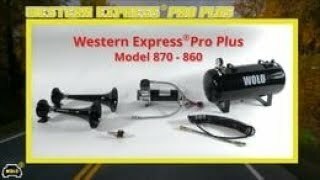 Western Express Pro train horn has two reinforced ABS black plastic trumpets that can be mounted independently when space is limited, the installer can even mount the trumpets in different locations. Each trumpet has a heavy-duty steel mounting bracket painted black and easily secures the to the vehicle with two bolts. Western Express Pro is designed to produce a powerful, 125 Db sound, sure to be heard. The on-board air system provided is designed to produce a large volume of high-pressure air to power the Western Express Pro train horn and includes everything necessary for a professional installation. The heavy-duty 12-volt motor of the compressor is balanced to precision, and there are 4 heavy rubber bushings mounted into the base virtually eliminating all vibration. Kit includes an extended length stainless steel high-pressure hose that allows the compressor to be surface mounted. A extra long stainless steel high-pressure hose connects the compressor to the 2.5-gallon metal air storage tank. Supplied with an independent mount 12-volt heavy-duty electric solenoid. Other features of the Western Express Pro train horn are; a tank that has a built-in pressure switch, manual water drain, pressure gauge, pressure relief valve and brass fittings. Kit comes with mounting hardware, 10 ft. of flexible high pressure hose and 20 ft. coiled filler hose with quality brass fittings. Short Trumpet: L 15-1/2 in. x front diameter 7-1/4 in. x rear 4-1/2 in. Long Trumpet: L17-1/4 in. x front diameter 7-1/4 in. x rear 4-1/2 in. Horn output with 90/110 psi: 125 db measured at 1 meter. Wolo Manufacturing Corporation (“Wolo”) warranties to the original purchaser, for one year from the date of purchase, that this product is free from defects in workmanship and materials. If there is such a proven defect, Wolo, at its option, will either repair or replace the item free of charge, if it is returned to Wolo within one year from the date of purchase together with proof of purchase as described below. Wolo reserves the right to inspect any defect prior to settling any warranty claim by repair or replacement. This warranty is limited as above provided and Wolo will not be responsible for fire or other casualty or accident, due to neglect, abuse, abnormal use, modifications, faulty installation of this product, or natural causes. 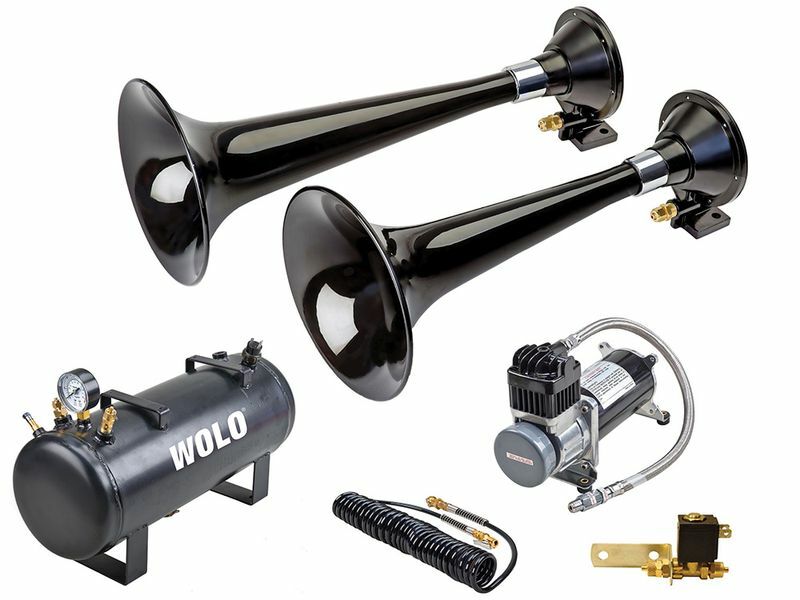 Everything needed to install a Wolo Western Express Pro truck train horn will be included with your order. Also, installation instructions are available on our site. If you have any questions, don't hesitate to give us a call seven days a week.